RRAC had a great showing at the 2017 LHSAA Swim Championships November 15-18, 2017 in Sulphur, LA. 15 swimmers representing 5 different high schools participated. The Calvary Baptist Academy led by Sarah Holt, Christian Booth and Benjamin Ponder finished in 5th place overall for the girls and 4th place overall for the boys. Holt was a top finisher 3 times with wins and set a new division meet record in the 100 fly (57.71) and 200 IM (2:11.00) as well as a member of the winning 200 free relay along with Molly McDowell and Liberty Haase. Holt was awarded Outstanding Swimmer of the Meet for Division IV. The boys had a strong showing as well with veteran swimmers Booth, Ponder and Martin McDowell as well as newcomer, Josh Roper. Sophomore Ellie Kairschner, representing Benton High School, was a 2-time winner in the 100 back (59.20) and 100 fly (58.19) and she was selected Outstanding Swimmer of the Meet for Division II. Loyola College Prep’s Katherine Bush was a top competitor in the 50 and 100 free. She was a 2nd place finisher by .03 in the 50 free. C.E. Byrd had 3 RRAC swimmers compete in the Division 1 meet led by Zach Carter, Reiley Arnold and Cameron Bradford. All of these swimmers swam best times in their events. Nate Epp, Karlie Key and Gracie Tichenor represented Captain Shreve all swimming lifetime best times and each finishing in the top 8 in their respective events. 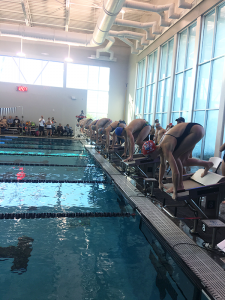 The weekend of December 1-3, 2017, Red River Aquatic Club took 62 swimmers to Baton Rouge for the annual event. RRAC finished in 2nd place behind the meet host, Tiger Aquatics and ahead of 3rd place finisher Austin Swim Club. Red River Aquatic Club took 54 swimmers to Ruston, LA on December 8-9th for the BAC Jingle Bell Meet. Each had wins in their events. Other RRAC winners were: Jolie Vo, Josiah Dang, Macy Monday, Makenzie Crowell, Rylan Sailer, Hanna Drozdz, Avery Aubrey, Caroline Carberry, Molly McDowell and Dru Thatcher. RRAC will be competing next in Ruston January 28-29th at the BAC Winter Meet.